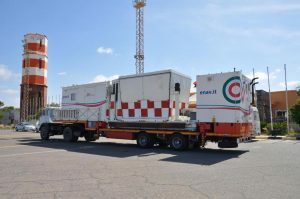 A new mobile air traffic control tower in arrived in Tripoli port from Italy yesterday to be installed at the capital’s Mitiga airport. The tower is one of two that Techno Sky agreed to install at the airport in a multi-million euro deal signed in Tripoli at the end of March. A new fixed control tower is still to be built. Together they will significantly increase Mitiga’s capabilities. The March contract, due to be completed by the end of the year also includes training. Techno Sky is a subsidiary of Italian air navigation service company ENAV.